As Donald Trump has racked up big wins among self-described “born-again or evangelical” Christians in many of the early primaries and caucuses, some religious leaders, political analysts and researchers have questioned whether many of these self-described evangelicals actually are evangelical Christians. Specifically, some analysts have expressed disappointment that the exit polls in some states have included only a single question about religion: “Would you describe yourself as a born-again or evangelical Christian?” They argue that this question may be too broad to accurately capture who really is and isn’t an evangelical Protestant. At the same time, some religious leaders have assumed that many of those who are telling exit pollsters that they are born-again or evangelical and that they voted for Trump aren’t really evangelicals at all because, for example, they rarely attend church. See our detailed tables for more information on the religious and political profiles of the evangelical electorate. While it is impossible to know for sure how many self-described evangelicals who also are Trump supporters embrace the tradition’s beliefs and practices, data from Pew Research Center’s 2014 Religious Landscape Study show that when people identify as “born-again or evangelical” Christians, they also are very likely to report specific beliefs and behaviors that are characteristic of evangelical Protestantism, and this is the case regardless of which political party they support. Indeed, most self-described evangelicals are quite religiously observant. More than six-in-ten, for example, say they attend religious services at least once a week, and another 16% say they go to church once or twice a month, according to our study. Fully 86% of evangelicals say religion is very important in their lives, and 83% say they pray every day. In addition, six-in-ten self-described born-again and evangelical Christians share their faith with others at least once a month, while an additional 16% say they share their faith at least several times a year. By comparison, other Christians – those who do not identify with the born-again or evangelical labels – are far less religiously active. For instance, just over half of Christians who do not identify as born-again or evangelical say they attend religious services at least monthly (53%) or that religion is very important in their lives (52%). And most non-evangelical Christians say they seldom or never share their faith with others. 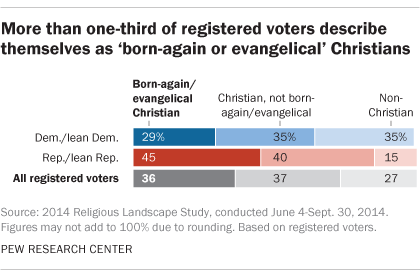 Those who identify themselves as “born-again or evangelical” Christians constitute a sizable share of the electorate – 36% of registered voters, compared with 37% who are non-evangelical Christians and 27% who identify with non-Christian faiths or with no religion at all. 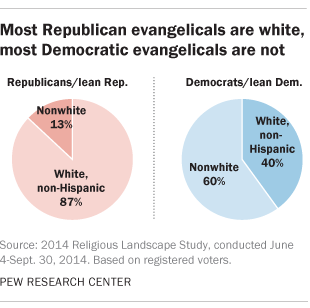 In addition, evangelicals are much more numerous within the Republican Party than among Democrats. 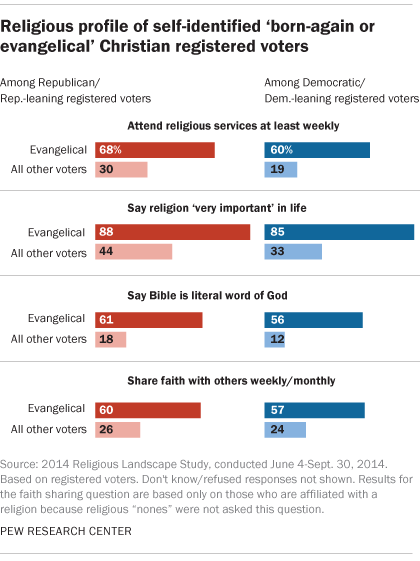 Still, nearly three-in-ten Democrats consider themselves born-again or evangelical Christians. The distinctiveness of these self-identified evangelicals is clear within both parties. Among those who say they are evangelical and Republican, 85% say they pray every day; about half of non-evangelical Republicans say the same. And most Republicans who identify with the born-again or evangelical labels say they believe the Bible is the literal word of God, which is more than three times the share of non-evangelical Republicans who express this belief. Likewise, self-described evangelicals in the Democratic Party are far more likely than non-evangelical Democrats to say that they attend religious services regularly, that they pray daily, and that religion is an important part of their lives. One key difference is race: Whereas 87% of Republican evangelicals are white, most Democrats who describe themselves as “born-again or evangelical” Christians are not white. It would be helpful if exit polls (and other surveys) for primaries and caucuses included more questions about religion. Indeed, more questions would make it possible to differentiate between highly observant evangelicals and those less devoted in their practice of the faith as well as between evangelical Protestants and those in other Christian groups, such as Catholics. In general elections, exit polls do typically include questions about religious affiliation and about religious attendance, and these additional measures provide valuable nuance and texture. It’s also worth bearing in mind that data from the Religious Landscape Study do not provide a perfect point of comparison with the exit polls. For example, the Religious Landscape Study asks people whether they are Christian before asking if they think of themselves as born-again or evangelical. By contrast, everyone who takes the exit poll (including religious “nones” and adherents of non-Christian faiths) has the opportunity to identify as a born-again or evangelical Christian. Nevertheless, the Religious Landscape Study does clearly show that when those who say they are “born-again or evangelical” are asked in more depth about their beliefs and practices, their responses are most often further confirmation that their behaviors are closely associated with evangelical Christianity.